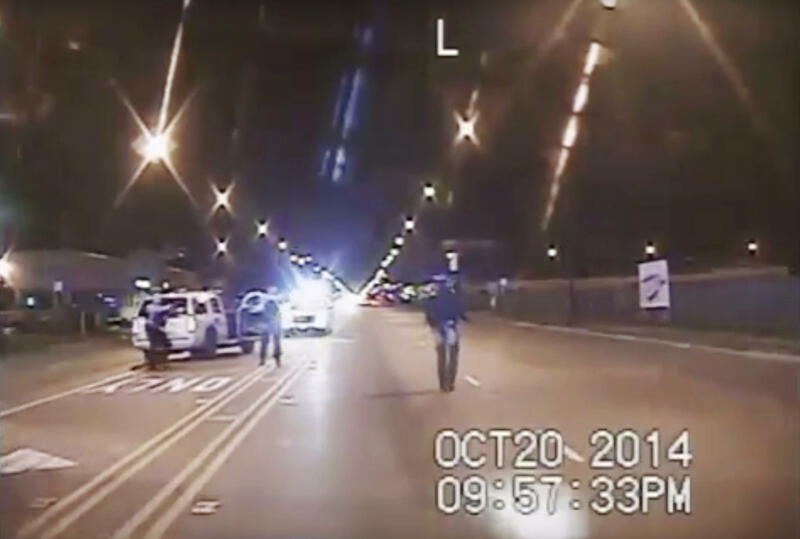 Dash-cam video shows teenager Laquan McDonald (right) walking down the street moments before Chicago police officer Jason Van Dyke fatally shot him. Three officers were later indicted on felony charges alleging they conspired to cover up the shooting. Police misconduct can do a lot of damage — inciting fear or upsetting the public trust that officers need to do their jobs, especially when their actions affect primarily people of color. On this week’s episode of the Criminal Injustice podcast, host and University of Pittsburgh law professor David Harris talks to Chicago Reporter data journalist Jonah Newman, whose reporting shows those incidents can also cost taxpayers millions in legal payouts. DAVID HARRIS: You and your colleagues at the Chicago Reporter looked at all of the police misconduct cases settled by the city and verdicts in court against the city from 2011 through 2016. How many cases, and what did they cost to settle? JONAH NEWMAN: The city paid out more than 940 lawsuits over the past six years costing a total of $280 million in the settlements and judgments and another $91 million in fees and costs to outside lawyers who they paid to defend officers and the city in some of these cases. So obviously that’s $370 million total over the last six years. HARRIS: Police misconduct is a very broad term. What were these police officers doing that warranted a settlement for money? NEWMAN: The majority of cases allege either false arrest or excessive force or both. A lot of these stem from kind of day-to-day interactions between police officers and citizens. Often they start with traffic stops or investigatory stops on the street, right? Kind of what we would call stop-and-frisk, and end in the use of some kind of excessive force or someone being arrested for something that they claim they didn’t do. A disproportionate number of these cases stem from incidents in communities of color — that’s one clear trend. Another trend we found [is that] in about one-quarter of the cases that allege excessive force, the plaintiff was also charged with either resisting arrest or assault of a police officer, which some civil rights lawyers said was sort of an effort by the police to cover up their use of excessive force. HARRIS: Chicago is a big city with a big budget. Give us some sense of what a year’s worth of these settlements would mean for Chicago. What do they have to give up, or what could they pay for instead? NEWMAN: They’ve spent about $47 million on average over the last six years. Last year, they spent $52 million on misconduct lawsuits and outside counsel. That money could’ve covered the cost of the city’s efforts to engage at-risk youth through afterschool programming, through summer jobs, through mentorship. Obviously the city is grappling with an increase in gun violence over the last couple of years, and the mayor has really touted these programs as ways to help stem some of that violence. And the money spent on police lawsuits last year could have doubled the city’s investment in that program. HARRIS: So they’re paying an average of $47 million a year, and they’re borrowing to cover the cost of it. Your newspaper is tracking those patterns over time. Are police looking at those patterns? Is the city looking at that, and what are they doing about it? NEWMAN: The city has not been looking at these patterns, despite the fact that it’s now been brought to their attention several times by first the police accountability task force that the mayor set up in the wake of the Laquan McDonald shooting and the aftermath. And then last year, both our reporting and a report from the city’s inspector general saying that the city should be looking at the trends and patterns in these lawsuits. And then again in January of this year, when the U.S. Justice Department finished their pattern of practice investigation of police misconduct within the city. [They cited] our reporting and actually said the city should be taking a closer look at these lawsuits. They’re still not doing it, as far as I can tell.